A galvanized Mansfield Town battled hard to earn a crucial three points and climb to 18th position in League Two. It was also the Stags’ game in hand on other teams around them and takes them five points clear of the relegation zone. It was a very similar encounter to Saturday’s draw with Northampton, a good first half followed by an extremely nervy second. That said, Luton had not lost since December and we were playing against 11 men this evening, rather than 10. It must also be said that the Stags did show slightly more attacking intent and kept the ball well on occasions in the second half, but the possession often lacked purpose. Adam Murray resisted the urge to place himself on the substitutes’ bench and concentrated fully on guiding his team from the touchline - a wise decision in my opinion. One change was made from the weekend, with Callum Elder coming in at left back for Lee Beevers - a much more natural player in that position. I was glad to see Murray had kept the spine of the team together in a bid to create consistent partnerships all over the pitch. Chris Clements was back on the bench. The Stags started steadily, keeping the ball well, indicating a move back towards the flowing football last on display in the Exeter game. Despite the passing and moving, there were no clear cut chances early on, the best on offer was Simon Heslop scuffing a shot through to the Luton keeper. After a rather tame opening to the game, Reggie Lambe appeared to be struggling and after 18 minutes was replaced by Rakish Bingham. 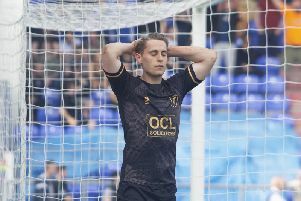 Bingham had been used as a scapegoat in some quarters for Saturday’s failure to pick up all three points. That was unfair in my opinion because, as I stated in the player ratings, he had the ball at his feet once and the rest of the time he spent trying to close down the opposition. He immediately looked lively, chasing down a weak backpass and forcing Mark Tyler to concede a throw deep in the Luton half. From the resulting throw, he made a darting run which was nearly picked out by Jack Thomas, but was well intercepted by the opposition defender. A quiet 10 minutes ensued until Luton fired their first shot in anger. Jonathan Smith was allowed to travel forward with the ball and send an angled drive towards goal, which was tipped around the post by Lenny Pidgeley and out for a corner. From the resulting corner, the Stags were ahead. The ball was cleared to the left flank where Oliver played the ball up the line for Thomas, who was bursting forward. Saturday’s Man of the Match stopped the ball just in front of the Mansfield dugout, picked his head up and switched the ball to the far side where Bingham was free. He let the ball bounce once and smashed it beyond Tyler and into the back of the net - a fantastic, Gerrard-esque pass by Thomas and a composed finish by Bingham. It was super counter-attacking by the Stags who, with the pace they carry amongst the front three, could use this as a regular tactic. The question now was whether the Stags would sit back for the remaining 65 minutes of the game, as they had on Saturday following Vadaine Oliver’s goal, or continue to attack. The answer was provided on 40 minutes when they created a great chance to double their lead. Some good, patient football by the Stags sparked into life when Elder played a great ball through to Bingham, who cut the ball back for Brown. Brown for some reason opted to bring the ball onto his weaker right foot and his shot was blocked. The ball came out to Thomas, whose volleyed effort was directed goalwards by Brown, but the flag was up against Junior who was in an offside position. Mansfield continued to get forward and Heslop, who had been everywhere in the first half as he was on Saturday, hit another poor effort straight at the keeper. As the first half came to a close, Luton should have been level. A long ball into the left channel was missed by Elder and a cross was looped to the far post where Howells was arriving, only to direct his header wide of the post. Richie Sutton did just enough jumping in front of him to put him off. It was a let-off for the Stags but a well deserved lead at half-time. As I visited the amenities at half-time, I overheard what appeared to be a sweepstake taking place on how deep the Mansfield backline would sag in the second half amongst fans queueing for the bar. Everyone seemed to know what to expect in the second half and partaking in a stiff drink seemed to be their method of preparation. My tab-hanging nearly cause me to bump into a hobbling Matty Blair coming out of the toilets. Clearly unhappy with his team’s first half display, John Still made two changes at half-time. One of those was Tottenham loanee Nathan Oduwa, who I had witnessed showing off his impressive repertoire of ball-juggling skills during the pre-match warm up. For the first 15 minutes of the second half, the Stags continued in the same vein as the first, playing some neat football. They were again close to going 2-0 up when Thomas’ high, mis-hit cross was fumbled by Tyler on the goal line, but nobody was following in. Thomas was at the centre of everything going forward, attempting to combine with Oliver on the edge of the box and nearly getting in on goal. He also send a long range effort well wide of the target after appearing off balance. As the hour mark came into view, the Stags predictably began to drop deeper. The midfield three of Thomas, Heslop and Ravenhill, who were all having good games, looked tired and were beginning to get overrun by a Luton team growing in confidence. After being so calm in possession in the first half, Sutton and Riley in particular began to look nervous, miscueing clearances and playing risky passes into midfield. Luton top goalscorer Cullen was beginning to look threatening and, following a one-two with Stockley, his shot took a bobble but was comfortably dealt with by Pidgeley. Noticing the drop in intensity, Murray acted quickly and introduced Clements for Heslop. Out of the three midfielders, Heslop was moving the most energetically but had started to give the ball away sloppily, which he is prone to at times. Thomas, although tiring, was still keeping hold of the ball and Ravenhill had provided an effective shield up until the hour mark. His leadership qualities are clearly valued by Murray. On 74 minutes, the Stags were given the kick up the backside they needed after a worrying 15 minutes in which they could not get out of their own half. A throw in from the Luton left was flicked on easily at the front post by Oduwa to Cullen, who had time to lob the ball over both his own head and Martin Riley’s and looked all set to level the scores, but somehow directed his finished wide of Pidgeley’s left hand post. It was an incredible miss from Cullen, who in the space of two days had probably had his confidence restored at the weekend with a goal and lost it all over again, not that many Mansfield fans will be losing any sleep over it. Mansfield seemed to gain encouragement from the miss and kept the ball well in spells in the Luton half, without ever intending to go for the jugular and leave themselves exposed at the back. Clements had brought a calming air to the midfield. On 85 minutes, Oliver was replaced by Matt Rhead. It was not Oliver’s best game in a Stags shirt but he held up the ball well at times in the second half and the free role he has been given to attack the ball at defensive corners seems to have plumbed the leak in that respect. He headed the ball to safety on a number of occasions this evening. Rhead took over the role vacated by Oliver with two towering headed clearances with Luton launching the ball forward in an effort to find an equaliser. The Stags’ defence continued to stand strong, and Tafazolli in particular was having a brilliant game, timing all of his interceptions to perfection. There was time for one last scare for Mansfield. In the second minute of the four added on, the ball was delivered low from the left and fell to Smith at the far post, who from a tight angle could only direct his shot into the sidenetting. The collective sigh of relief must have been audible for Murray on the other side of the pitch from the majority of Stags fans. At the final whistle, a huge cheer erupted from the two sides of the ground housing the Mansfield faithful and chants of Yellows could be heard all around. Elder slumped to the ground with exhaustion and relief and was helped up and hugged by Pidgeley. Junior Brown, who had worked tirelessly all night threw both fists into the air with joy. The togetherness and team spirit was evident everywhere you looked. A second unlikely mention for Steven Gerrard in a Mansfield Town blog - Adam Murray gathered all squad members together on the pitch in a huddle and gave a rousing speech, just as the Liverpool skipper had infamously done during their quest for the title the previous season. This is not a team that will shirk a relegation battle and I cannot see them failing to achieve their aim, which must at this point be safety, in the way the Anfield team did. All in all it is three points closer to safety for Mansfield Town and a pleasing performance from every single player. They managed to combine patient, passing football with directness when needed and solid defending, both individually and collectively. Martin Riley gets stick from some fans but the defence looks a lot more solid with him in it in my opinion. Riley and Tafazolli are our best partnership at this moment in time and should be kept together at all costs. The midfield three work well together, Ravenhill doing the dirty side of the game, backed up by Heslop, who is sloppy at times but all action and looks to move the ball forward. Thomas has been a revelation so far and given the team much needed creativity. He is not afraid of his putting his foot in either, as the two yellow cards from two games will attest. Junior Brown’s work rate cannot be questioned and if he could just be a bit braver going forward the Stags would reap the rewards. Bingham has staked his claim for a regular starting berth with a great goal, displaying a willingness to carry the ball forward and also track his man back. Credit must go to Murray for trying to create consistency and reverting to a more attractive style of play, whilst appearing to keep the resolve of the team intact. He will be hoping his team can carry on their two game ‘unbeaten streak’ into an away clash with another of his form clubs Oxford United on Saturday. The 4-5-1 system should be perfectly set up for an away counter attacking performance, with the pace of Brown and Bingham, who must maintain his place, on the flanks. It will only work if the Stags persist with ball on the floor and balls into the channels for the front three to run on to. It will still be a worry that the Stags appear incapable of scoring more than one goal in a game at present, but the positive signs are there to be built on and here’s hoping for Mansfield Town’s first back-to-back wins since mid-September. Pidgeley - 7 - Did what he needed to do well. Appears to be a good signing and brings experience to the defence. Sutton - 7 - Good distribution in the first half, worsened in the second as nerves crept in but did his defensive job well, especially when putting off Howells at the end of the first half. Riley - 7 - Still a few hesitant moments and miskicks, but he sweeps up well and works well with Tafazolli. Tafazolli - 8 - My man of the match. Was a colossus at the back, in the air and on the deck. Also calm in possession overall. Elder - 7 - Like the way he drives forward with the ball and was solid at the back apart from one error. Ravenhill - 7 - Great first half in doing the dirty side, struggled from 60-75 minutes but stuck at it and kept his team ticking around him. Lambe - I won’t give a rating because I don’t know for how long he was playing with an injury, but I heard Richard Cooper telling him to wake up, in a slightly less polite manner, from the Upper West! Heslop - 7 - Appeared to be everywhere and nobody can doubt his work rate. Just needs to concentrate a bit more in possession at times. Thomas - 8 - Brilliant assist for the goal and generally inventive. Looked tired after the hour mark and surprised he was left on but carried on flying into tackles. Two games in and has his own song. He’s one of our own. Brown - 7.5 - Excellent defensively and also released the ball a bit quicker than previous weeks. The only time he didn’t was when he had a great chance in the area. Would still like to see him take on his full back a bit more. Oliver - 7 - Worked hard and held the ball up well at times, but not as involved as recent weeks and looked tired from the hour mark. Bingham (on for Lambe 18) - 8 - Took his goal brilliantly and worked tirelessly to help out Sutton in the second half. Played like had point to prove. Clements (on for Heslop 69) - 6.5 - Calming influence on the midfield, keeping the ball well and also defending with the team. Rhead (on for Oliver 85) - Two good headed clearances when team needed it most.